Travelling is a popular pastime for many seniors. 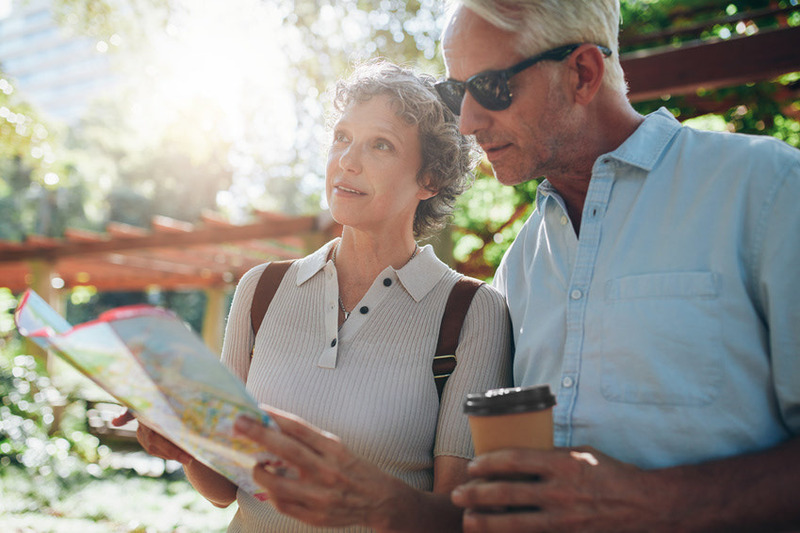 Depending where you go and when, there are precautions that people of all ages need to take when travelling, but for seniors, there are some additional things to keep in mind. Take a look below for some ways to make travelling safer as a senior, helping promote independence and variety when making travel arrangements. Travelling seniors should research their destination and travel options whether they’re travelling alone or with others. Keep in mind that some places and arrangements are more “senior-friendly” than others, for example, cruises are very accommodating and offer activities, facilities, boarding options and more that are suitable for all ages and abilities. Some destinations, vacation packages and resorts are also designed with seniors in mind. Air travel is often the safest (and fastest) way for seniors to travel to these places. Plus, airlines and travel websites offer senior discounts on plane tickets. Always travelling with assistive devices (e.g. walkers, canes, medical bracelets, etc. ), as well as items for comfort (e.g. a travel pillow, comfortable, weather-appropriate clothing, etc.). Because travelling can sometimes be unpredictable, it’s highly important for seniors to plan ahead. Plan, reserve and confirm everything at least six weeks before the travel date, including any special services. For example, reserving free wheelchair service at the airports, seat assignments for disabled persons, assistance through the airport, car service, medication management and much more. Additionally, make sure all travel documentation is in order, especially if travelling abroad. Bring copies of statements about existing medical conditions, drug prescriptions, insurance cards, telephone numbers and personal identification. Of course, you’ll also need hard copies of your insurance cards, boarding passes, prescriptions and ID cards. These cards should be valid and up-to-date, especially the passport. Up-to-date passports include valid expiration dates and photos. In fact, it's advised that your passport remain valid for at least 6 months before your trip. If it's time to renew your passport, visit PhotoStop to receive the best passport photos Edmonton has to offer.